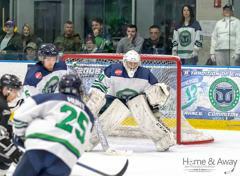 "Blake played only one year as a Whaler, he has carried himself as a professional both on and off the ice and will forever be known as a Whaler Champion", stated Whalers Owner Patrick Cavanagh. "His commitment to Whaler Nation and his teammates was unparalleled, I will always appreciate that he chose to stay with his team even though he had a fantastic opportunity to leave early for his University commitment. Worcester just became a better team, we all look forward to watching his continued success". 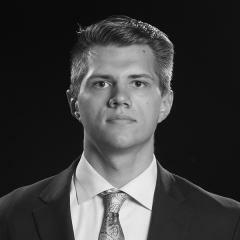 The Hampton Roads Jr. Whalers are proud to announce that 1998 goaltender Blake Bjella from Mesa, AZ has committed to playing college hockey in 2019 for the Worcester State University Lancers. 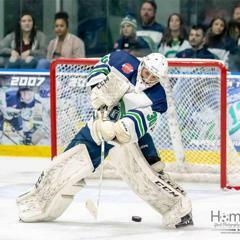 Bjella, in his 1st season in the Whalers, posted 17-3-0-0 record in the regular season with a 2.37 GAA and .915 save% with 4 shutouts. 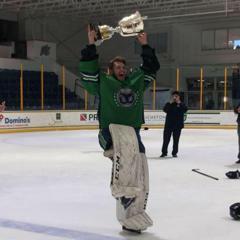 In the post season, he got stronger, posting a record of 2-0 with a 1.00 GAA and .957 save% en route to helping the Whalers Premier team capture the 2019 USPHL Premier National Championship. "I want to thank my teammates for the amazing year filled with lifelong memories and friendships", stated Bjella. 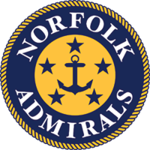 "I also want to thank our management, Patrick Cavanagh, my coaches Rod Taylor, Kody Rodriguez, and the rest of the Hampton Roads Whalers organization. Whaler Nation is truly a large family that welcomed me with open arms and to be a part of another championship team was an absolute pleasure. I am excited for the opportunity to get an education and further my hockey career at Worcester State". "Blake was a part of our very successful Goalie tandem", stated head coach Rod Taylor. "He had a great season and came up with some big saves when we needed them. He is an unselfish player and complimented his goalie partner Alec Lindberg with a very supportive attitude. Always working hard to better himself, Blake has a solid work ethic that has paid off. Very proud of him and glad he could be a part of the Whaler family and bring home another championship. Best of luck and congratulations on joining the Worcester State University Lancers along with teammate Chris Ciolek". Bjella becomes the Whalers 9th commit of the 2018-19 season and joins Chris Ciolek (Worcester State), Matthew Hanchon (Southern New Hampshire), Conner Hunt (Manhattanville), Max Loga (Lebanon Valley), Cody Wilson (West Virginia), Brandon Osmundson (Utica), John Moncovich (Utica), and Jaxon Rutkowski (Utica) as committed Whalers.